I’ve never been much of a runner myself and was once described as built for comfort not for speed. I found this quite hurtful at the time, probably because it was unerringly accurate.That is not to say that I cannot appreciate the sight of a someone running and I love to see small children running around. This has come in useful this week as I do some drawings for a website for a school, and this is just one of them. As I completed it I was reminded me of my daughter when she was small and energetic, she’s not that big now and no less energetic, but this just reminded me of how she was back then. For the techies amongst you this drawing has been put through illustrator and traced, which gives it that vectored look. I used to spend hours trying to get this smooth line and feel to my drawings some years ago and can now do it in seconds. To me it loses a little in the translation but gains something else in the process. I’m a bit of a techie myself, I like to try and find these new processes that are available from the latest software. I’m of the same age as some people who say: “I can’t be bothered with computers” and it irks me beyond the reasonable.I have no time for them. 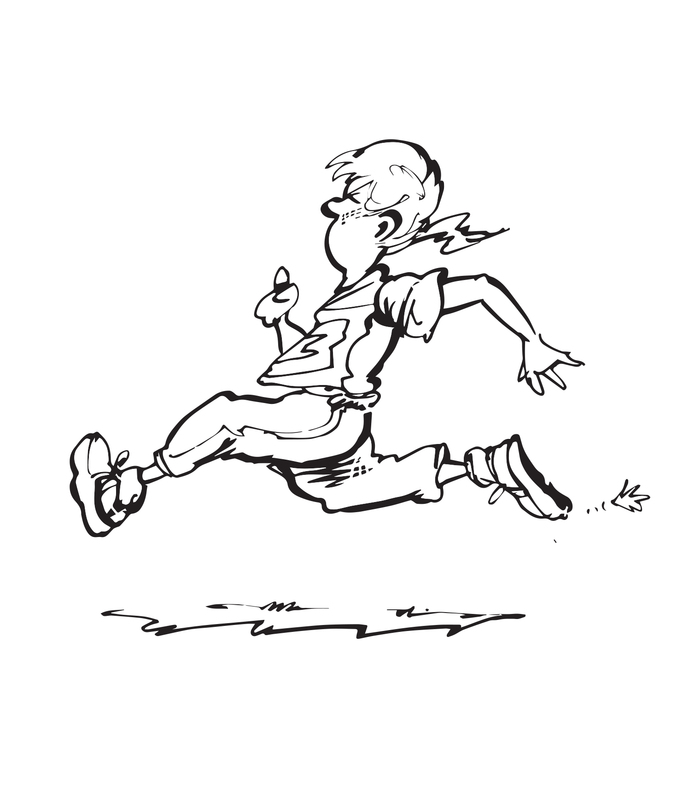 Some old dab was on the radio the other day proudly saying that she managed fine without, well “bully for you” I thought, you just don’t know what you are missing, so don’t knock it.In today’s society of runners and riders, you’re not even in the race….tenuous link with drawing.